JUAN GONZALEZ: Well, you mention that the — in the war on drugs, four out of five people arrested have actually been arrested for use of drugs, not for — or possession or use of drugs, not for the sale of drugs. Could you talk about how the — both political parties joined in this increasing incarceration around drug use? The drug war was launched in response to racial politics, not drug crime. The drug war was part of the Republican Party’s grand strategy, often referred to as the Southern strategy, an effort to appear — appeal to poor and working-class white voters who were threatened by, felt vulnerable, threatened by the gains of the civil rights movement, particularly desegregation, busing and affirmative action. And the Republican Party found that it could get Democrats — white, you know, working-class poor Democrats — to defect from the Democratic New Deal coalition and join the Republican Party through racially coded political appeals on issues of crime and welfare. AMY GOODMAN: Yes, I just wanted to bring it up to President Obama, because this piece you wrote, very interesting, at tomdispatch.com called "The Age of Obama as Racial Nightmare." Explain. This vast new racial undercaste — and I say “caste”, not “class,” because this is a population which is locked into an inferior status by law and by policy — this vast population has been rendered largely invisible through affirmative action and the appearance of success with, you know, a handful of African Americans doing well in universities and corporations. The sprinkling of people of color through elite institutions in the United States, due to affirmative action policies and the limited progress of middle-class and upper-middle-class African Americans, creates the illusion of great progress. It helps to mask the underlying racial reality, which is that a racial caste system has been reborn in the United States. Young men of color, in particular, are labeled as felons, labeled as criminals, at very young ages, often before they even reach voting age, before they turn eighteen. Their backpacks are searched. They’re frisked on the way to school, while standing waiting for the school bus to arrive. Once they learn to drive, their cars are searched, often dismantled in a search for drugs. The drug war waged in these poor communities of color has created generations of black and brown people who have been branded felons and relegated to a permanent second-class status for life. And the reason for their excommunication from our society, our mainstream society, is for engaging in precisely the same kind of drug activity that is largely ignored in middle-class and upper-middle-class white communities. People often say to me, “Well, if people — if, you know, black and brown men don’t want to be labeled felons, well, then they just shouldn’t commit drug crimes.” But, you know, we have known, as a nation, for a long time now that simply prohibiting drug activity does not lead people to stop using illegal drugs. We learned that lesson with alcohol prohibition. Banning the use of alcohol didn’t discourage many people from using or selling alcohol. And people of color are no more likely to use or sell illegal drugs than whites. Our stereotype of a drug dealer in the United States is of an African American kid standing on a street corner with his pants hanging down. But the reality is that drug dealing happens everywhere in America. Drug markets in the United States, much like our society generally, is relatively segregated by race. Blacks tend to sell to blacks. Whites tend to sell to whites. JUAN GONZALEZ: We turn now to the second part of our interview with legal scholar, civil rights advocate and author, Michelle Alexander. 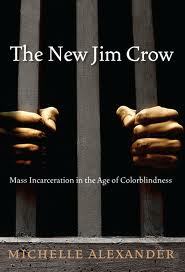 Her book is The New Jim Crow: Mass Incarceration in the Age of Colorblindness. A former director of the Racial Justice Project at the ACLU of Northern California, she now holds a joint appointment at the Kirwan Institute for the Study of Race and Ethnicity and the Moritz College of Law at Ohio State University. AMY GOODMAN: We continued yesterday’s interview with Michelle Alexander after the broadcast, and we started with a clip of President Obama’s speech at the NAACP centennial celebration last year. PRESIDENT BARACK OBAMA: We’ve got to say to our children, yes, if you’re African American, the odds of growing up amid crime and gangs are higher. Yes, if you live in a poor neighborhood, you will face challenges that somebody in a wealthy suburb does not have to face. But that’s not a reason to get bad grades. That’s not a reason to cut class. That’s not a reason to give up on your education and drop out of school. No one has written your destiny for you. Your destiny is in your hands. You cannot forget that. That’s what we have to teach all of our children. No excuses. AMY GOODMAN: Michelle Alexander, “no excuses.” Can you respond to President Obama? MICHELLE ALEXANDER: Well, I think, you know, a major point that is often lost in debates about the so-called underclass, you know, poor African Americans who are trapped in racially segregated ghettos, the point that’s often missed is that huge percentages of the people residing in those communities have been branded felons, and therefore discrimination is perfectly legal against them. You know, employment discrimination is perfectly legal. Most job applications, ranging from Burger King clerk to accountant, ask whether you’ve been convicted of a felony. And studies show that, you know, about 70 percent of employers say they won’t even consider hiring someone who’s been convicted of a drug felony. Public housing is off-limits to you if you have been convicted of a felony. For a minimum of five years, you are deemed ineligible for public housing once you’ve been branded a felon. Discrimination in private housing market’s perfectly legal. So here you are, recently released from prison, having been branded a felon for engaging in precisely the kind of drug activity that’s ignored in middle-class white communities. You’re branded a felon. You can’t get a job. And then public housing is off-limits to you? Where are you expected to sleep? So an aunt or grandmother takes you in. Now, let’s say you’re one of the lucky few who manage to get a job. Well, up to 100 percent of your wages can be garnished — that’s right, up to 100 percent of your wages can be garnished — to pay the cost of your imprisonment. Increasing numbers of states are requiring former prisoners to pay back the cost of their imprisonment, pay back court costs, court processing fees, even the cost of their representation, even if they’ve been assigned a public defender, and back child support. You’re required to pay back all of the accumulated child support that you incurred while you were in prison. So up to 100 percent of your wages can be garnished, even if you’re one of the lucky few who manage to get a job after being branded a felon. What is the system designed to do? The system is designed to send you right back to prison, which is, in fact, what happens to the vast majority of people who are released. About 70 percent of former prisoners are returned within three years. And the majority of those who are returned are returned within three months, because the obstacles, the legal barriers to just surviving on the outside, are so great. I’m often — you know, people often say to me, “Well, I know somebody who is a felon and who managed to get a job. You know, it’s possible to get a job,” they say. Well, it may be possible, but what kind of job? Why is it that, you know, our young kids, young black and brown kids, are expected to be locked into low-wage jobs for life, if they’re lucky enough to get them, but kids in other communities are given the opportunity to go on to college, to compete for a full range of job opportunities? During the Jim Crow era, the problem wasn’t that black people couldn’t get jobs; it was that they were locked permanently in a lower tier of jobs. And that’s the reality. That’s the reality. For us to tell young African American kids in ghetto communities, “Your destiny is in your own hands,” that may be an inspirational message, but for many of them it may turn out to be a lie, because the rules and laws that govern ghetto communities today and the war that is being waged there ensures that a large majority of black and brown boys in those communities will be branded felons and then relegated to a permanent second-class status for life. JUAN GONZALEZ: Michelle Alexander, I’d like to ask you about Arnold Schwarzenegger. Governor Schwarzenegger, at his State of the State address in January, called for privatizing some of the state’s prisons. GOV. ARNOLD SCHWARZENEGGER: The priorities have become out of whack over the years. I mean, think about it. Thirty years ago, ten percent of the general fund went to higher education, and only three percent went to prisons. Today, almost 11 percent goes to prisons and only seven-and-a-half percent goes to higher education. Spending 45 percent more on prisons than universities is no way to proceed into the future. AMY GOODMAN: Your reaction to Governor Schwarzenegger’s newfound concern about the situation with the prison system in his state? MICHELLE ALEXANDER: Yes, well, many people reacted with glee to Governor Schwarzenegger’s kind of apparent embrace of the Books Not Bars theme that had been a rallying cry for grassroots organizations in the state for more than a decade. But if you read between the lines there, what Schwarzenegger is actually saying is not that we should change our laws to ensure that nonviolent drug offenders don’t end up spending years or decades behind bars or that we should rethink harsh mandatory minimum sentences or our three-strikes laws, which have been responsible for the prison boom in California and other states around the country. His remedy has not been to reduce prison populations through kind of rethinking draconian laws, but instead to privatize, try to save money, make warehousing and caging human beings cheaper by privatizing the system. Certainly, you know, this announcement must have been met with glee on Wall Street, where, you know, many companies like the Correctional Corporation of America, you know, is making millions of dollars, and it hopes to expand its market of caging human beings for a profit. So, sadly, although, you know, Schwarzenegger embraced the Books Not Bars motto, what he actually plans to do in practice is, or may well be, worse than the system that we have today. JUAN GONZALEZ: I’d like to ask you about another aspect of this whole issue, in terms of — you mentioned mandatory sentencing laws, especially in relationship to the war on drugs. One of the aspects that rarely gets much attention, and you might want to talk about it, is how mandatory sentencing laws have essentially corrupted the criminal justice system by pressuring many defendants to basically cop a plea rather than take their chances through an actual trial, where their guilt or innocence might be decided by a jury. MICHELLE ALEXANDER: That’s right. We will never know how many innocent people are doing time for supposed drug offenses in the United States, but there’s good reason to believe that those numbers are higher than they’ve ever been, because of mandatory sentencing laws. Today, for a relatively minor drug crime, you could be looking at five, ten, even a life sentence in prison. Now, if you are arrested and charged with, you know, a relatively minor drug offense and told that you will spend twenty-five years in prison if you take your case to trial, but if you cop a plea and get only three years, a few months, or even be willing to be labeled a felon for life, you know, you’ll be out in a matter of months, days or just a few years, most people aren’t willing to take the risk that they could be forfeiting decades of their life for a minor drug offense and will take the deal, whether innocent or guilty. MICHELLE ALEXANDER: The pressure to plead guilty is overwhelming. AMY GOODMAN: Explain then what that means, once a person is a felon, in terms of the rights they lose for life. MICHELLE ALEXANDER: Yes, well, once you’re branded a felon, you may be denied the right to vote; automatically excluded from juries; and legally discriminated against in employment, housing, access to education and public benefits. You know, the very rights that we supposedly won for African Americans in the civil rights movement no longer exist for those labeled felons. That’s why I say we have not ended racial caste in America; we’ve merely redesigned it. All the old forms of discrimination, the forms of discrimination we supposedly left behind, are now perfectly legal once you’ve been labeled a felon. And thanks to the war on drugs, millions of people of color have been branded felons for relatively minor drug activity, you know, in the past few decades. MICHELLE ALEXANDER: Our prison population has quintupled. AMY GOODMAN: To what, in terms of the world, comparing our prison population to the rest of the world? MICHELLE ALEXANDER: Yes, well, our prison population has quintupled. We’ve gone from about 300,000 people behind bars in the 1970s — you know, a time, by the way, that many civil rights activists thought that our rates of incarceration were egregiously high. But we went from about 300,000 people in prison and jails to more than two million today. And the vast majority of that increase has been due to drug offenses. About two-thirds of the increase in the federal prison population is due to drug offenses, and more than half of the increase in the state population. AMY GOODMAN: I just wanted to ask if you could talk about the jailing of black men often in white, rural communities and what that means in terms of bringing federal aid into those communities. MICHELLE ALEXANDER: Yes. You know, kind of a well-kept secret about the way our census laws and redistricting operates in the United States is that people who are warehoused in prisons — and the majority of new prison building in the United States has taken place in relatively white rural areas — the majority of the people who are put in those prisons, particularly in a state like New York, are poor people of color. But the people warehoused in those prisons are denied the right to vote, right? But those people behind bars are counted through the census as part of the local population for the purposes of redistricting, leading to a greater number of state representatives assigned to those rural communities, even though the people behind bars can’t vote, and they’re not accountable to them. And additional federal funding flows to those communities, because their population has been inflated because they have such large prison populations. Meanwhile, the poor communities of color, you know, from which these prisoners came, lose representation in their state legislatures, because their population has declined. And the funding and support that might otherwise flow to those communities is reduced, because their numbers have been deflated as a result of the mass imprisonment of their community members in rural white communities. AMY GOODMAN: Michelle Alexander, we want to thank you very much for being with us. Her new book is called The New Jim Crow: Mass Incarceration in the Age of Colorblindness. Thank you so much.